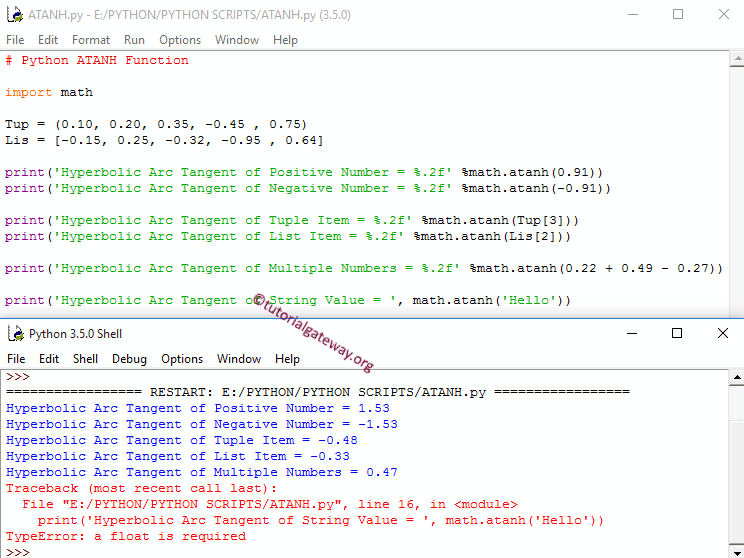 The Python ATANH function is one of the Python Math function which is used to calculate the Trigonometric Hyperbolic Arc Tangent for the specified expression or number. ATANH() function is also called as inverse of hyperbolic Tangent, Please refer Python TAN Function article to understand the Tangent Function. In this article we will show you, How to use ATANH() function in Python Programming language with example. Number: It can be a number or a valid numerical expression for which you want to find Hyperbolic Arc Tangent value. If the number argument is positive and Negative number, ATANH() function will return the Hyperbolic Arc Tangent value. If the number argument is not between -1 (exclude) and 1 (exclude), ATANH() function will return ValueError. If the number argument is not a number, ATANH() function will return TypeError. First, We declared Python List and Tuple with some random values. Next, We used the ATANH() Function directly on both the Positive and Negative values. Following statements will find the hyperbolic arc Tangent of the corresponding values. TIP: You can try values greater than or equal to One but it will throw ValueError. Next, We used the ATANH() Function on Python Tuple and List items. If you observe the above screenshot, ATANH() function is working perfectly on them. Next, We used the ATANH() Function directly on multiple values.